As Gov. Jerry Brown and state lawmakers look for places to cut in the state’s $85 billion budget, a popular program that provides in-home services for hundreds of thousands of disabled and elderly Californians has become a natural target. The In-Home Supportive Services program is the fastest growing major social program in state government. Democrats defend it as a humane and cost-effective way to keep people living independently rather than in more costly nursing homes. But Republicans have questioned the program’s policy of paying relatives to care for their loved ones and have suggested that the program is rife with fraud. Both parties, however, share a concern about the program’s rapid growth. Enrollment has more than doubled in the past ten years. So has the cost of caring for the average client. As a result, spending on the program has increased by an average of 13 percent annually, according to the non-partisan Legislative Analyst’s Office, which serves as a key advisor to the Legislature. The cost increases have been driven by higher wages and benefits for the caregivers and more hours of care for the recipients. The in-home workers were once paid only minimum wage. But many of them were unionized earlier this decade and their wages and benefits improved. This made it easier for clients to find help but also increased the cost of the program. The average client receives about 85 hours of care per month in their home. The program now costs about $5.5 billion a year. Since 1993, the federal Medicaid program has paid for half of that cost, leaving the state and the counties to split the rest. The state’s share came to about $1.5 billion last year. Former Gov. Arnold Schwarzenegger tried repeatedly to cut the cost of the program by limiting wages, eligibility and services, but most of his proposals were rebuffed by Democrats in the Legislature. This year, Brown proposed to cut $486 million in state money from IHSS, essentially eliminating the program for about 87 percent of its recipients, or about 375,00 elderly or disabled people. “The goal of the administration’s proposal is to try to achieve savings while maintaining a core level of care to these clients,” said H.D. Palmer, deputy director of the Finance Department. Legislators responded with a scaled back plan that seeks to save the same amount of money with far less impact on the recipients. Lawmakers accepted Brown’s proposal to require clients to obtain a doctor’s certification stating that they would be forced into a nursing home if they lost the services they were getting at home. This is expected to end services for about 43,000 people and save the state about $120 million a year. Legislators are also counting on getting an additional $121 million in federal funds and have approved $128 million in cuts to the program that will be specified later. Among the most controversial proposals still on the table is Brown’s plan to eliminate domestic services – housecleaning, laundry, cooking – for people who live with their caregiver. These are mostly cases of people who are being cared for by a family member. One feature of the program that has been widely praised is its policy of allowing recipients to choose their own caretaker. The client is considered a consumer and the state government, acting through the counties, handles eligibility screenings and pays the wages for the caregivers. This policy empowered the clients to choose their own family members as caregivers, in turn allowing the family members to stay at home and not forfeit an income. Today, the majority of caregivers are relatives of the recipients. Advocates say that without this provision the relatives would have to work outside the home, leaving the recipients without care. They would eventually end up in nursing homes at an increased cost to the taxpayers. But the same provision that empowered the disabled also opened the door for fraud as some people inflated their hours and others simply concocted relationships between caregiver and client that did not exist. State officials reported a backlog of 400 potential cases last year, although they say they don’t know how much money is lost to fraud. “There is no way to actually determine the amount of fraud,” Norman Williams, spokesman for the California Department of Health Services, said. Over time, changes were made to IHSS in the name of fraud prevention. As of 2010, potential IHSS caregivers are screened through the IHSS authority within their county to verify that they have not been convicted of crimes like elder abuse or government fraud. The Health Services Department reported having received 136 case referrals for IHSS fraud since June of 2010, just within Southern California alone. If the state recovers all the money alleged to have been lost in those cases, it would amount to $2.5 million, Williams said. Others say that the more aggressive efforts to deter fraud may have deterred clients from seeking services to which they are entitled. “I think a number of people believe that former Governor Schwarzenegger’s anti-fraud measures enacted in 2009 have had a real impact on caseload,” said Karen Keeslar, Executive Director of the California Association of Public Authorities, county agencies that run the program for the state. Aside from the anti-fraud efforts, the question of whether cutting the program could actually save or cost the state money is complex. 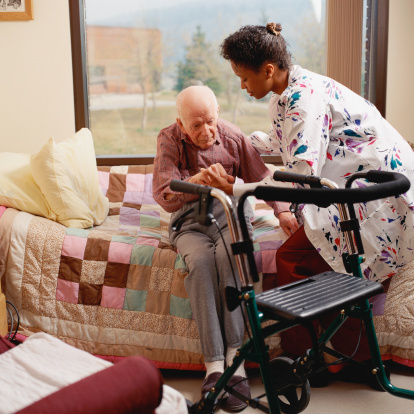 The obvious alternative for many IHSS recipients is to move into a nursing home. And since nursing home care can be three or four times more costly than in-home services, it is assumed that the state would be forced to spend more on elderly and disabled care in the absence of the in-home program. But not all recipients would be forced to enter an institution if they are denied IHSS benefits. A report by the LAO last year found that while IHSS is cost effective for the state budget alone, it is unlikely that enough patients would be forced to enter nursing homes to make the program cost effective for both the state and the counties. And if the program is preserved for the most impaired clients while eliminating or sharply curtailed for others, the increase in costs associated with nursing home care could be minimized. The quality of life of those who lose their assistance would likely decline, but they and their families, not the state’s taxpayers, would feel the pain.